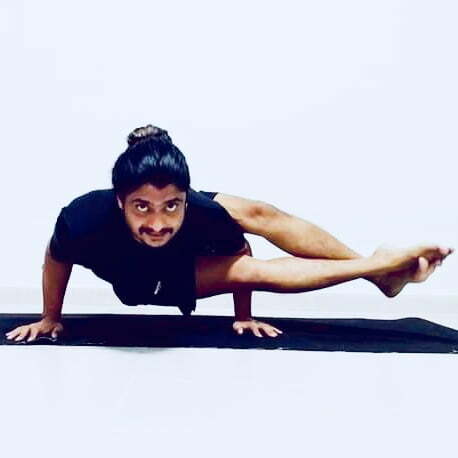 Experience Sree was first introduced to yoga in 2006.At first he came to the class for assisting his Uncle,while he take classes for other students.He noticed students are doing very slow and rhythmic movements and was very surprised and curious. One day he mimicked some of the yoga postures in a funny way.The master was watching his movements and found the inborn talent of movements.Master convinced him that he could do wonders if he practice well. Then he started learning yoga very seriously and mastered postures,Meditation,Philosophy and whatever he could exploit from yoga with the help of his Master. Meanwhile he used to take classes for other students with Master’s permission. Skills He joined Sivananda Yoga Vedanta center and did his teachers training course. he found his Ashtanga Teacher and continued the journey in Yoga with him for two years. After that he went to Indian Navy to teach yoga for the soldiers and came back and joined in a Sivananda affiliated organisation as senior yoga teacher. He has experience in teaching more than 1000 students and 20 teachers for their certified courses . He is well aware of Bhagavad Geetha and Yoga Philosophy.His practice includes not only Yoga but Ayurvedic treatments and natural herbal Medicine.He travelled almost all part of India to meet yoga teachers and students to Know the different levels of Yoga. Sree is a uniquely known Yoga teacher for his dynamic style and way of teaching.His observations and depth of knowledge is steeped with years of practice.The physical and mental benefit that he enjoyed through the yoga have been regarding and life changing.Sree aims to bring those to other people in a safe and productive environment with sense of fun and enjoyment. Now he is busy in Tirisula Yoga developing his yoga for the people who are stressed, depressed and also focused in gaining flexibility and mental peace.